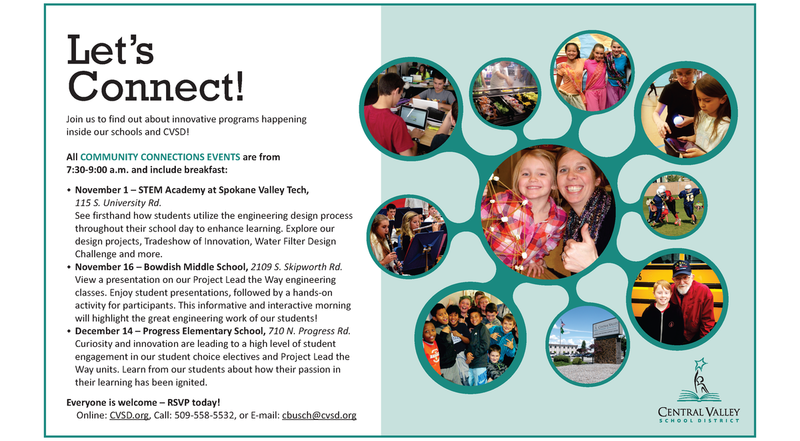 Join us to find out about innovative programs happening inside our schools and CVSD! ALL COMMUNITY CONNECTIONS EVENTS are from 7:30-9:00 a.m. and include breakfast. To register, click on the date and school you'd like to attend below and follow the prompts. 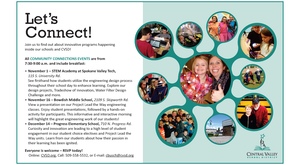 See firsthand how students utilize the engineering design process throughout their school day to enhance learning. Explore our design projects, Tradeshow of Innovation, Water Filter Design Challenge and more. View a presentation on our Project Lead the Way engineering classes. Enjoy student presentations, followed by a hands-on activity for participants. This informative and interactive morning will highlight the great engineering work of our students! Curiosity and innovation are leading to a high level of student engagement in our student choice electives and Project Lead the Way units. Learn from our students about how their passion in their learning has been ignited. Everyone is welcome - RSVP today by clicking above or e-mail cbusch@cvsd.org or call 509-558-5532.